Valid local news with the new CretaLive application! The award winning for the validity of local news, CretaLive, entrusts Netmechanics for informing Cretans through the new mobile and tablet application. 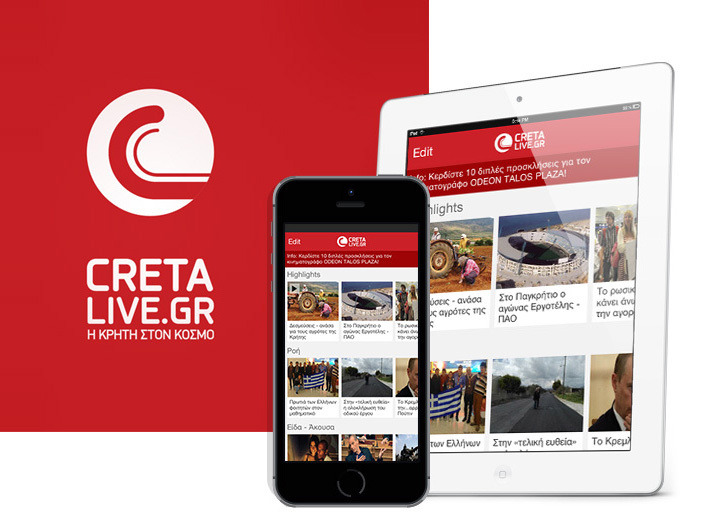 CretaLive LTD is a management company of news portals which operates at Heraklion from 2010. The most known portal of the company, the cretalive.gr, offers daily to over 30,000 readers the most valid news on Crete. Furthermore, the application should allow the user to choose the order of the news in his device according to the topic as well as to leave a comment or send a photo to be published on a specific column in the Portal. The solution was given from Netmechanics by developing two applications: one for Android-powered devices and one for iOS. • to reach younger readers among whom is widespread the use of smartphones and tablets. • to increase even more the number of readers. • to offer specialized custom news for mobile and tablet users.